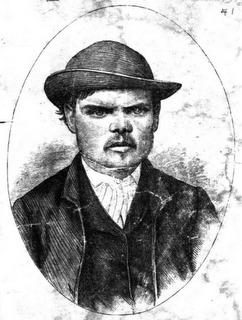 On this date in 1866, mass murderer Anton Probst (sometimes called “Antoine”) was hanged in Philadelphia, Pennsylvania. He made national headlines in its time, but today he is forgotten except among serious students of violent crime. Probst was a native of Germany, the son of a carpenter. He later claimed he had a normal childhood and “never did anything wrong” until after he had left his home country. 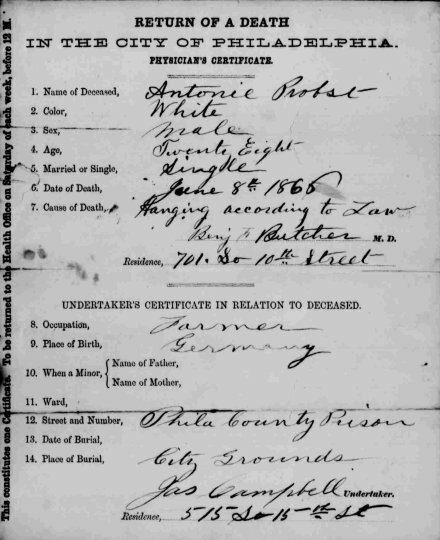 He moved to the United States in 1863, in the middle of the Civil War, and became a professional “bounty jumper”: he would join up with a Union Army regiment, collect the $300 enlistment bonus, desert as soon as he could, then enlist with another regiment and start the cycle over again. He made a tidy living for himself this way until 1865, when he accidentally shot his thumb off and was discharged from the military for good. Probst squandered his enlistment bounties on liquor and and rapidly fell into post-discharge penury. 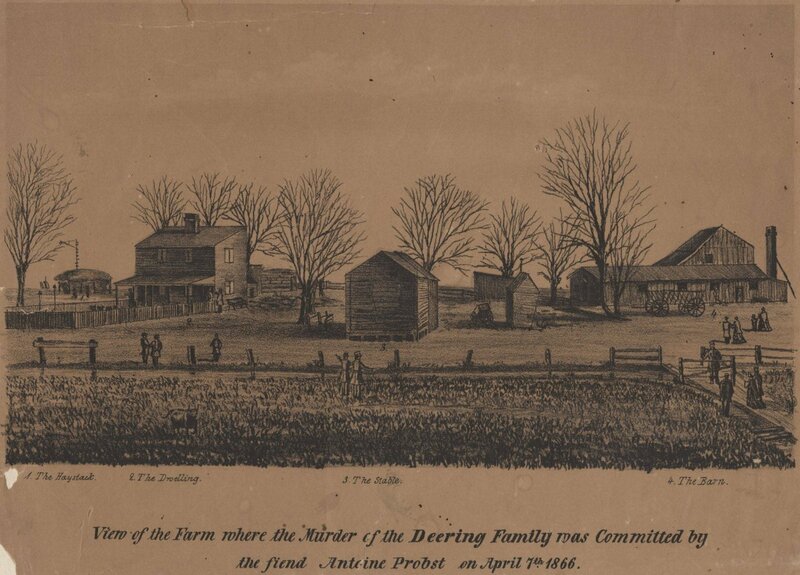 This was why, in the fall of 1865, he hired himself out as a farmhand to Christopher Deering, an Irish immigrant who lived in a rural part of Philadelphia with his wife and five children. Deering offered Probst a salary of $15 a month plus room and board. Probst quit after only a few weeks, though, not being accustomed to honest labor. He soon fell ill and, without a source of income, wound up in the workhouse. In dire straits, he returned to the Deering farm on February 2, 1866 and begged for his job back. And, although Probst’s behavior from before had given Christopher’s wife the creeps, the farmer took pity on him and re-hired old Thumbless. Things went well for the next two months. But unbeknownst to his employer, Probst had thought of another way to get money. Christopher’s nearest neighbor, Abraham Everett, lived a quarter of a mile away. Everett subscribed to several local weekly newspapers and, every weekend, Christopher would send his son to borrow the previous week’s editions. One Saturday, the boy never showed up. Nor did he arrive on Sunday. Or for the next several days after. By Wednesday, Everett was getting worried and decided to go to the Deering place and see if they were all right. He found the farm deserted and the horses inside the barn, nearly dead of thirst and starvation. After giving food and water to the distressed animals, he went and looked through the window into the Deering family’s house and saw it had been ransacked. Seriously alarmed now, Everett forced the window open and climbed inside, and found every room in the house in a state of disarray. In the bedrooms, the beds had been torn and flipped upside down, dresser drawers had been rifled through and clothes were scattered everywhere. There was not a soul to be seen. At this point, Abraham Everett went off to get help, summoning another neighbor and then the police. Inside the barn they found something Everett had missed while he was helping the horses: Christopher Deering’s body, partially covered in hay, alongside the body of a cousin visiting from New Jersey. “His head,” crime historian Harold Schechter reports in his book Psycho USA: Famous American Killers You Never Heard Of, “was crushed to pieces, almost to powdered bone, and his throat was cut … from ear to ear.” Christopher’s cousin had similar injuries. A search of the barn turned up the bodies of Christopher’s wife, Julia, and four of the couple’s five children, stacked in the corncrib. All of them had their throats cut and their skulls bashed in. The only survivor in the family was the oldest child, ten-year-old William Deering, who had been staying with his grandparents at the time of the murders. And so the family line did not die out: according to this Philadelphia Inquirer article, William has 60 descendants. The murder weapons were lying around bloodstained and in plain sight on the property: a hammer, a small hatchet and a full-sized ax. Hours later, the police found the last body hidden in a haystack a few hundred yards from the barn: seventeen-year-old Cornelius Carey, one of the Deerings’ farmhands. that a man who had methodically slaughtered eight people, including three prepubescent children and a fourteen-month-old infant, would lose no time in putting as much distance between himself and the crime scene as possible. For all his low cunning, however, Anton Probst was incapable of prudent calculation. Indeed, from all available evidence, he thought of nothing beyond the gratification of his immediate physical needs. Hours after the murders, Probst was no further away than a house of ill repute on Front Street in Philadelphia, where he spent the night with a $3 prostitute. For the next few days he hung around his favorite bars drinking, making occasional excursions to pawn items he’d stolen from the Deering farm. He was in no hurry to leave. Only the day after Probst’s grisly crimes were discovered, a police officer named James Dorsey spotted him strolling around near Market Street. Something about his bearing, and the way his hat was pulled low over his eyes, made the lawman suspicious. He walked up to him and noticed the stranger’s right thumb was missing. “You are, are you? Take a walk with me.” Dorsey grabbed the murderer’s arm and hauled him off to the nearest station house. There the police searched him and determined he was wearing Christopher Deering’s clothes, and carrying the farmer’s snuffbox and pistol. Probst had left Elizabeth Dolan’s carpetbag at a tavern earlier that day; it contained a number of small items, including cheap children’s toys, all of which were from the Deering farm. The police had to transfer Probst from the Philadelphia City Jail to Moyamensing State Prison for his own safety, after a would-be lynch mob stormed the jail. Probst claimed he had only killed Cornelius Carey and tried to blame the other murders on an imaginary accomplice; at his trial (which began on April 25, less than three weeks after the murders) his lawyers argued that the case against him was strictly circumstantial and not proved beyond a reasonable doubt. But the trial’s outcome was clear from the beginning. The jury deliberated for only twenty minutes before convicting. You can read it all here in his very own words, or below, in mine. At first his intention had just been to rob the family of everything they had, then flee. But he found himself unable to accomplish this because there were always too many people around. About a week before the murders, it occurred to Probst that perhaps murder might be necessary to facilitate the robbery. At first he thought he could just kill Christopher Deering, but as he mulled the matter over he decided the rest of the household would have to die as well. First to go was Cornelius Carey as they were working together in the field. Then Probst went into the barn and lured the others in one by one, killing them as they each came inside: eight-year-old John Deering, then the mother, Julia, then the rest of the children: six-year-old Thomas, then four-year-old Annie, and finally the baby, Emma. Probst estimated that it all took about half an hour. Christopher Deering was off picking up that visiting cousin from the ferry, and they didn’t arrive back at the farm until the afternoon. Probst was waiting for them. While the guest Elizabeth Dolan went into the house, Probst told Christopher one of the animals was sick and he had to go inside the barn. There he killed him like the others, then called Miss Dolan to the stable. She was the last one to die. If we are to believe the killer’s account, the victims all died quickly and quietly, and did not suffer. None of them, he said, so much as cried out after the first blow. Once finished, Probst tore the house upside down looking for things to steal, washed, shaved, changed out of his bloody clothes and put on some of Christopher’s, and had himself a snack of bread and butter. At sunset he headed off to town. After his death, Probst’s body was handed over to the physicians at Jefferson Medical College, who subjected it to a series of bizarre experiments with electricity. When they finished with their fun they performed an autopsy. Probst’s brain turned out to be unusually small, almost a full pound lighter than average. What, if anything, this has to do with his apparent psychopathy is anyone’s guess. His head and arm were later displayed in the Jefferson Medical College museum.